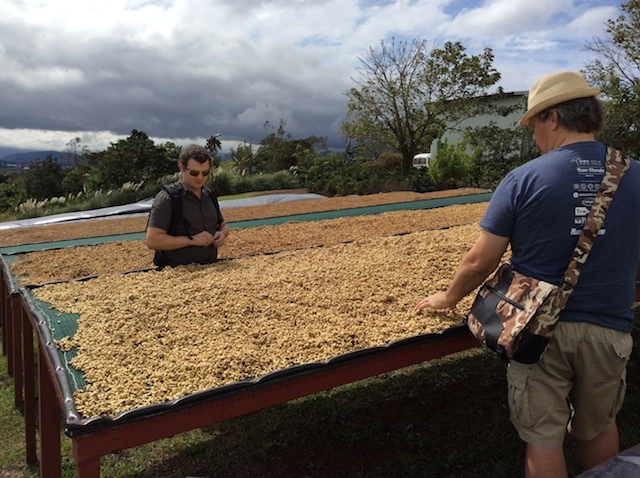 From January 14th till 25th i joined a professional organised coffee field trip in Costa Rica. During the trip i started to post pictures and stories online, the rest i did when being back home in Berlin. The postings cover each day of the 10 day trip, every day another impression. The postings are in reverse order the oldest one at the bottom part of this page, scrolling down all entries. 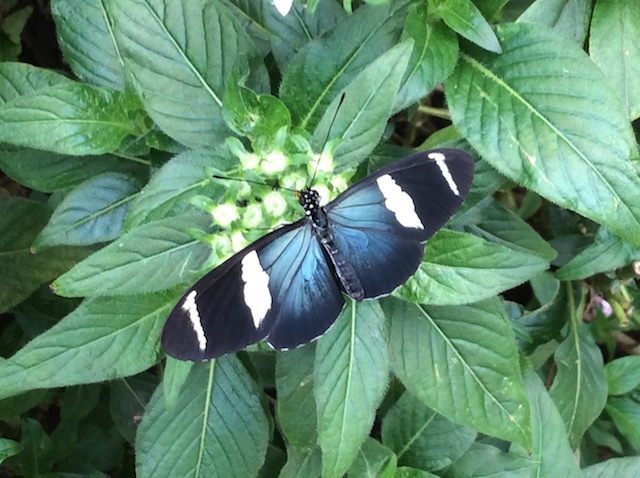 Enjoy reading and be inspired by Costa Rica - its nature, its people and its beautiful coffee! 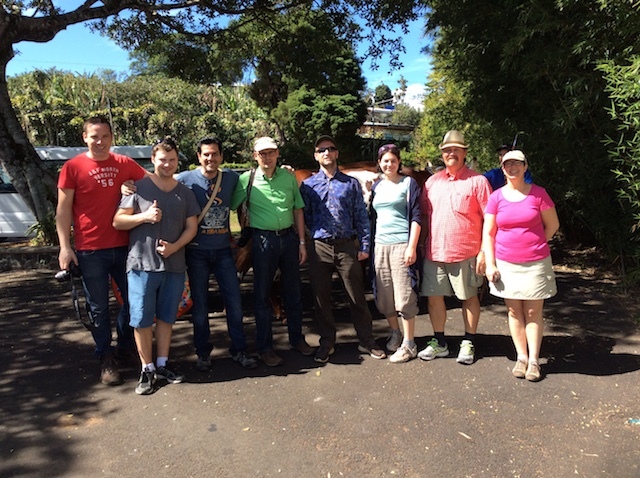 Im Januar 2015, vom 14.-25., nahm ich an einem Kaffeetrip nach Costs Rica teil, der professionell organisisert war. Während des Trips und nach meiner Rückkehr berichtete ich in kleinen postings über meine Eindrücke und Erlebnisse. Dabei entschied ich mich für die englische Sprache, damit es für noch mehr Menschen zugänglich ist. Ältere Einträge befinden sich am Ende dieser Seite, jüngere vom Ende des Trips gleich zu Beginn. Viel Freude beim Lesen und der Magie Costa Ricas, seiner unfassbare schönen Natur, seinen herzlichen Menschen und dem leckeren Kaffee! Friday, our last day in Costa Rica before heading back to Europe. 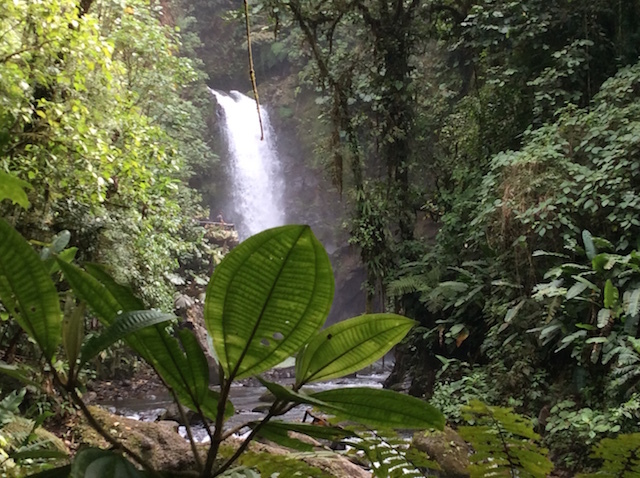 Some leisure time was on our program, and we visited La Paz Waterfalls. This is high up the hills north from San Jose, almost one hour driving. 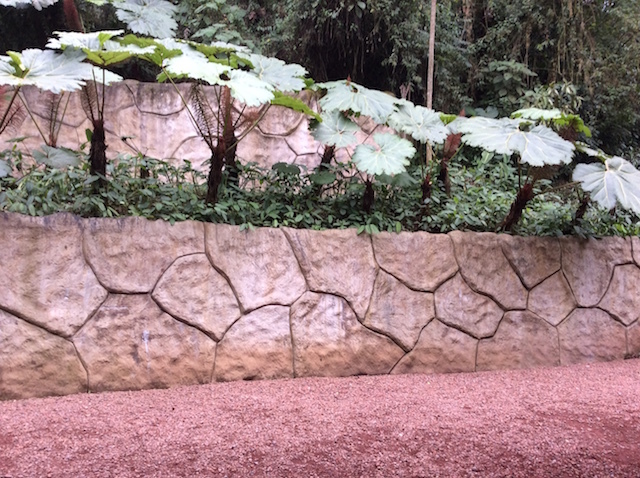 In the parc we saw a snapshot of Costa Ricas rich and beautiful biodiversity in plants and animals. As i wrote earlier the colours are just amazing and are very diffficult to capture with a a camera. 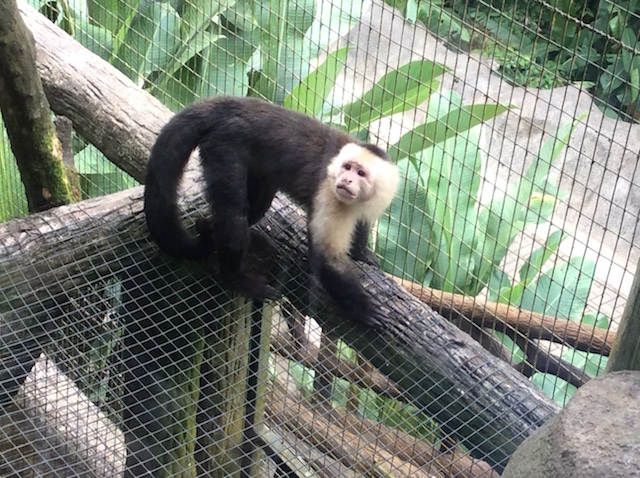 The ape below is a Capuchin and it remembered me about a cappuccino, and maybe there is a connection who knows ;) It was a beautiful trip! 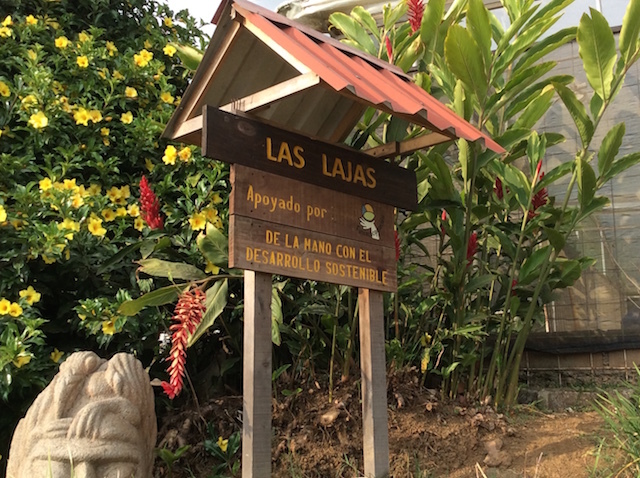 Our last coffee encounter we experience at Las Lajas Micromill. Las Lajas is located in between two volcanos, that brings wind and a different climate than in other parts of Costa Rica. 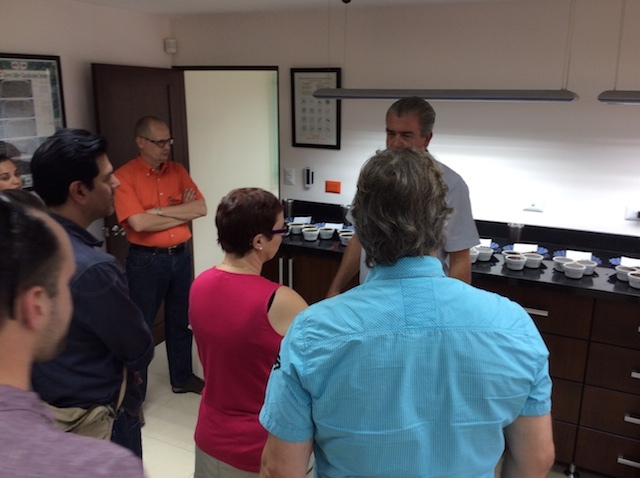 The owners of the micromill welcomed us warmly and showed us around and explained us about their coffee processing. 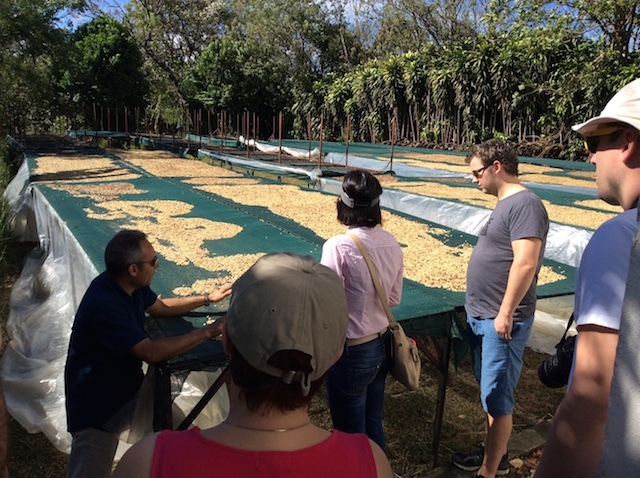 They are specialised on all types of honey processing, and some coffees were just put on the patios, the mucilage was still fresh! During the cupping we tasted one of the most delicious coffees and experienced an awesome sunset. 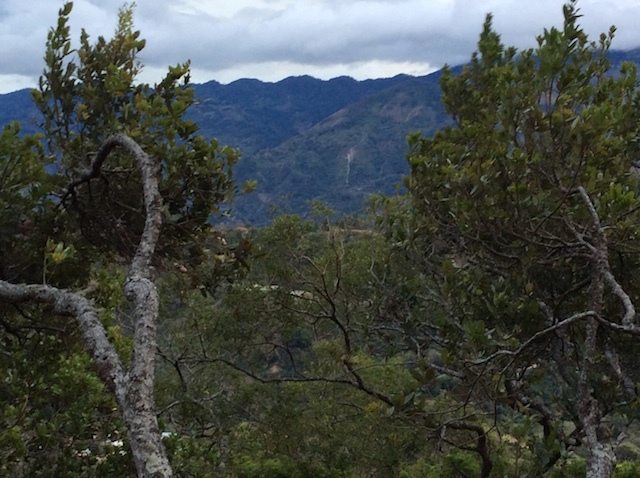 It was a beautiful and very impressive end of the day and end of our coffee trip through Costa Rica! We start this early thursday with a visit at Café and coffee roastery Boleto. Diego offers us a tour at his roastery and we have the pleasure to enjoy some of his roastings as well as a Cup of Excellence winning coffee - from the chemex, simply coffee heaven! Boleto, btw, is a coin that pickers receive for their coffee and they exchange for money afterwards. 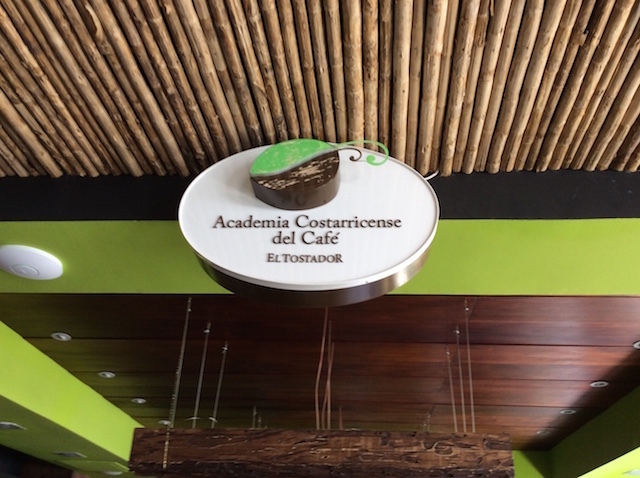 We continued our tour at the Costa Rican Coffee Academy owned by El Tostador ("the roaster"). Very nicely located in the center of San Jose directly connected with a nice café. 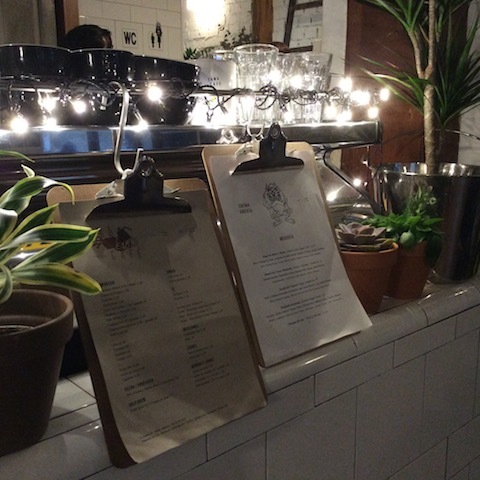 The final stop is the Café Coteca where we also met back many lovely people that we met throughout our week in Costa Rica for a common dinner offered by SCACR, the Costa Rican Speciality Accociation! 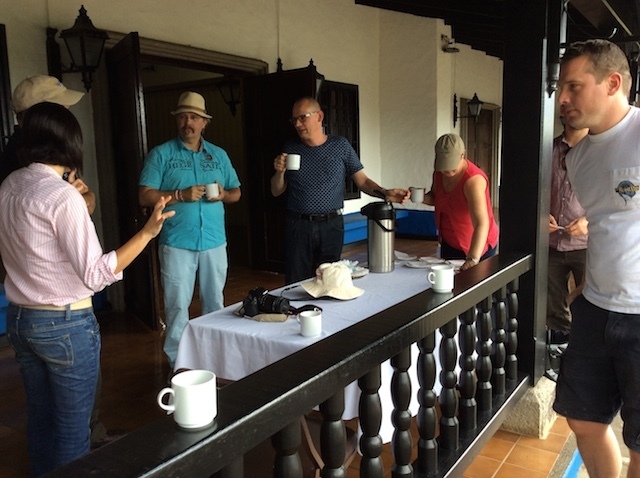 It was the perfect ending for an unforgettable coffee week in Costa Rica! 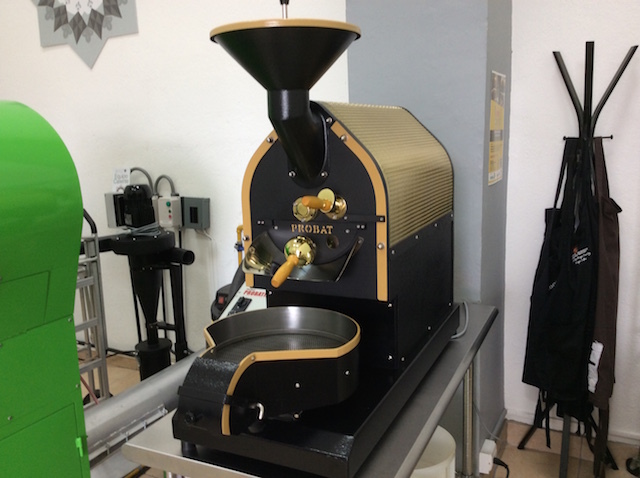 This lovely golden Probat looks in natura even more impressive. 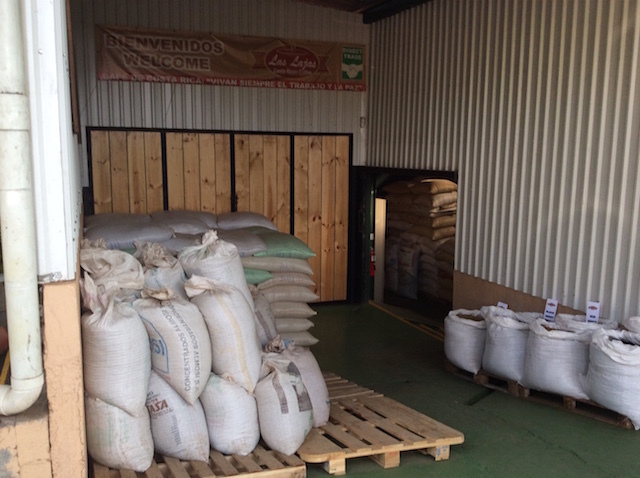 The green roaster next to it is a Dietrich that just arrived at Boleto few days ago. 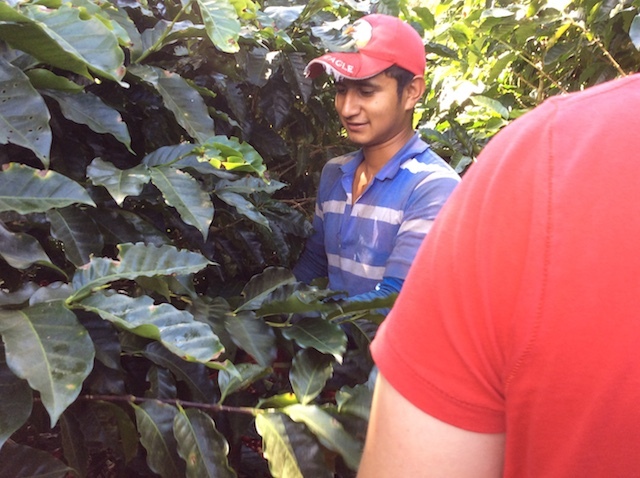 Diego told us that he started his roasting career with a small home roaster. 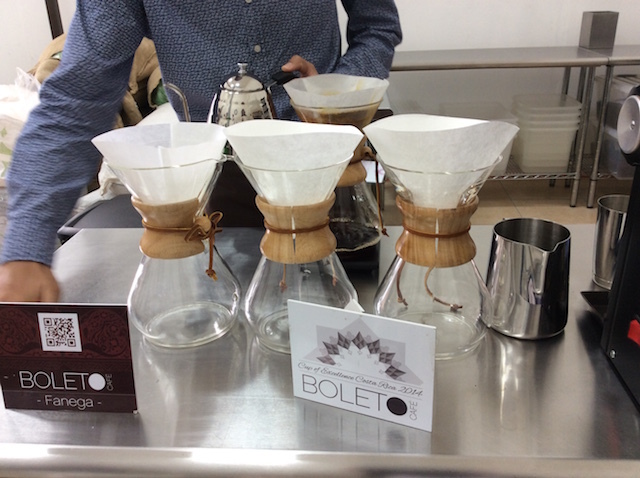 Friends and family loved his coffee and so he decided to continue and now there is Boleto! 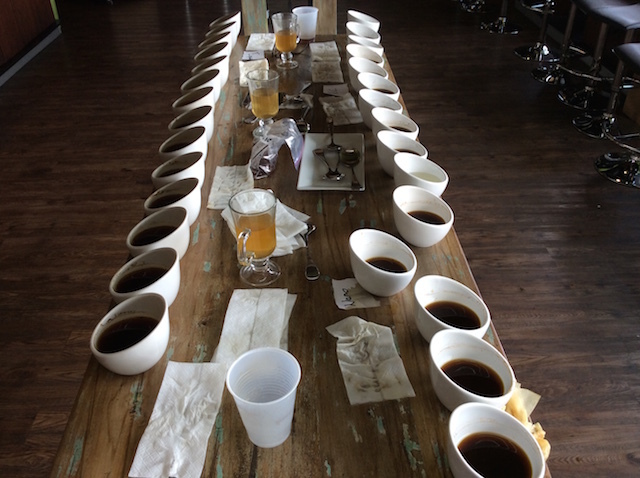 As a beautiful hightlight we enjoyed an extensive cupping of various coffees. Delicious! Afterwards we had some tasty lunch at the Café. Thanks for this visit! 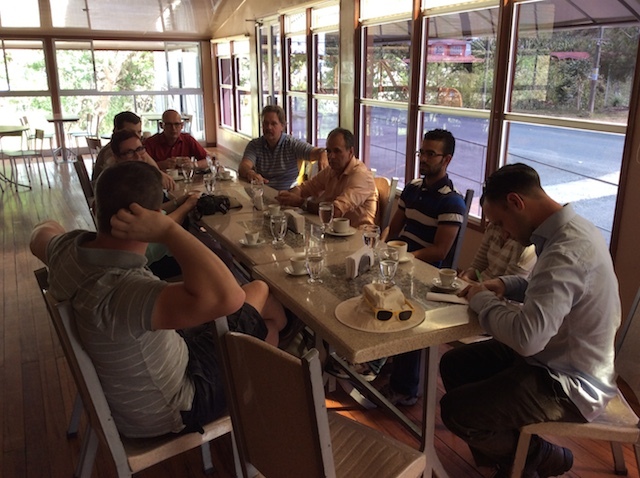 We were warmly welcomed with delicious coffee and awesome self-made sweet pastries! The café offers various snacks, an extensive coffee menu with all type of brewing methods - the perfect place for coffee lovers! The Café Coteca is one part of a bigger center where Costa Rican artists offer their work, a shop is included, and a restaurant as well. It is a remarkable inspiring spot to be! 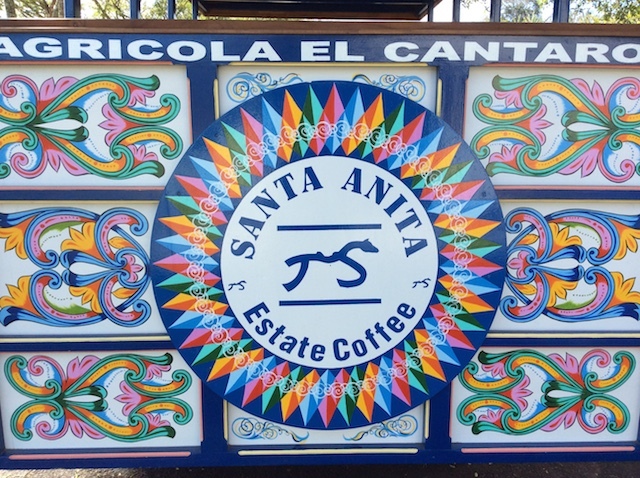 Wednesday - Today we visit Finca Santa Anita Coffee Estate and later on CoopeVictoria. Finca Santa Anita offers a beautiful view down the valley. Directly when we arrived they prepared this wagon for us to visit the farm and meet coffee pickers at work! Meet the pickers! 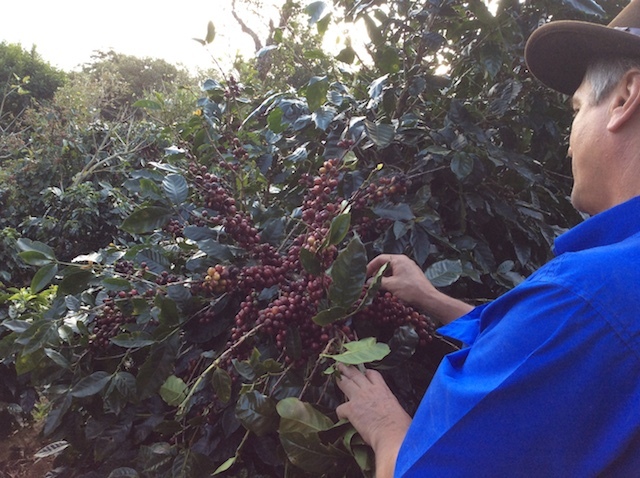 Being among pickers, picking self the ripe ones and fill the cajuela was a unique and stunning experience for me! I was allowed to help Michelle and did my best to keep up with her picking speed - not successful of course, as she is a pro. 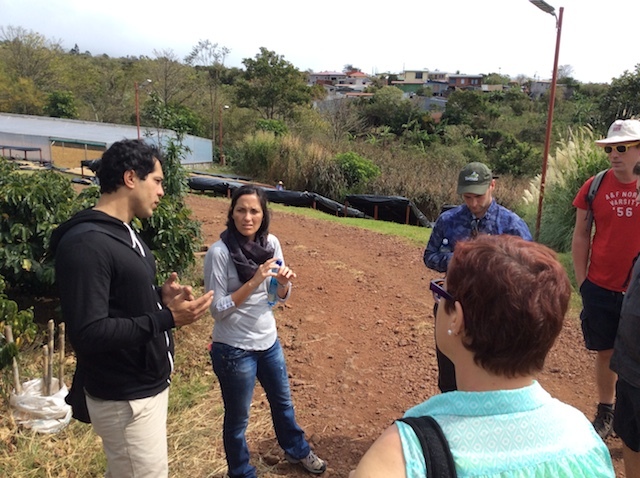 At the Cooperative Victoria we started with a cupping and got an impression about the coffees they grow. 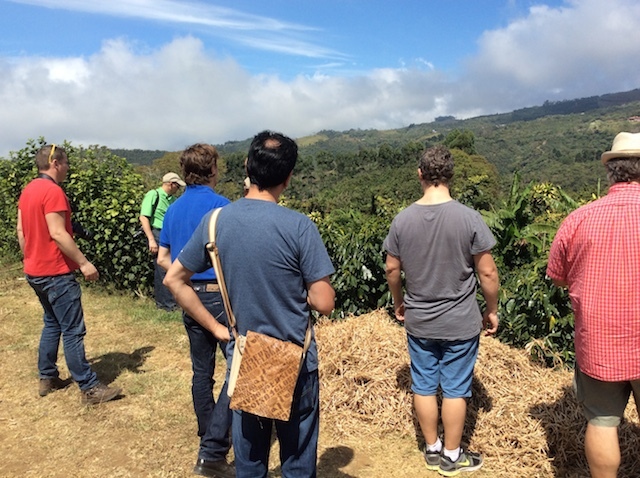 Coffee nerds starring at Geisha coffee plants - Could be a proper film title for it. 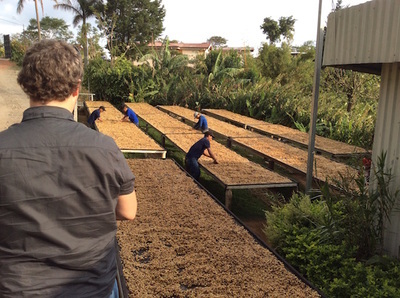 In fact, one part of the Santa Anita Coffee Estate is dedicated to this special arabica variety. 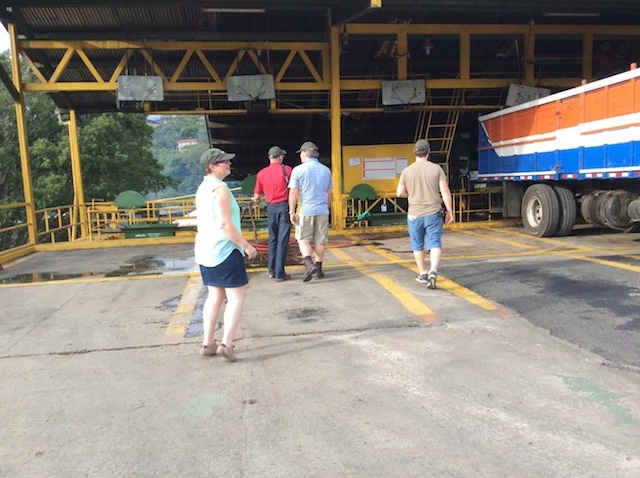 During the tour at the wet and dry mill we learned a lot about the interdependence of water and energy. The prices for electricity in Costa Rica are very high, in particular in the morning and evening hours. 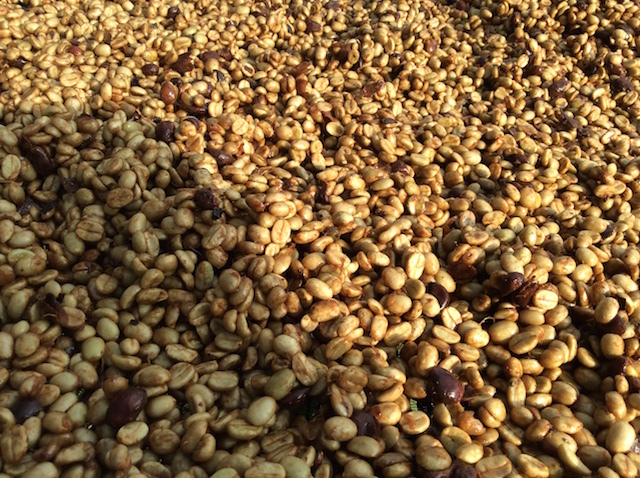 One reason why also coffee processing is done during cheaper hours around noon and during the night! 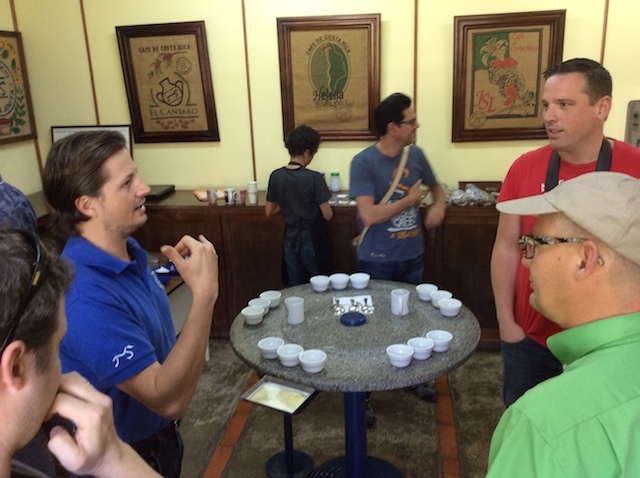 During our time at Santa Anita Coffee Estate we also enjoyed a cupping of their coffees. By the time visiting we learned that 80% of the current harvest is finished and most of it sold already. The coffees were fresh and we enjoyed the different tastes of them. As i wrote earlier, the colors of the flowers in Costa Rica is so intense, it is really difficult to capture this beauty with a normal digital camera. Well, this one i could not resist, i hope you get an idea how it was in real life. 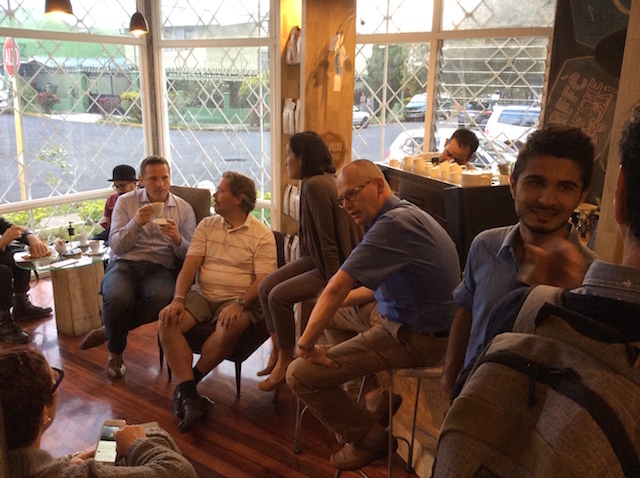 We start this day at Coricafe where the vice-president Eric receives us with a cup of coffee and presents the business of Coricafe. Interestingly, his father set up the business of exporting coffee in the late 1950s. His father joined the presentation and our visit later as well! Coffee is a handcraft, once more we realize this seeing this worker who marks the jute coffee bags with ink and a template. Depending on the destination of the bag, the quality of the beans, the ordering company those templates can be individually designed. 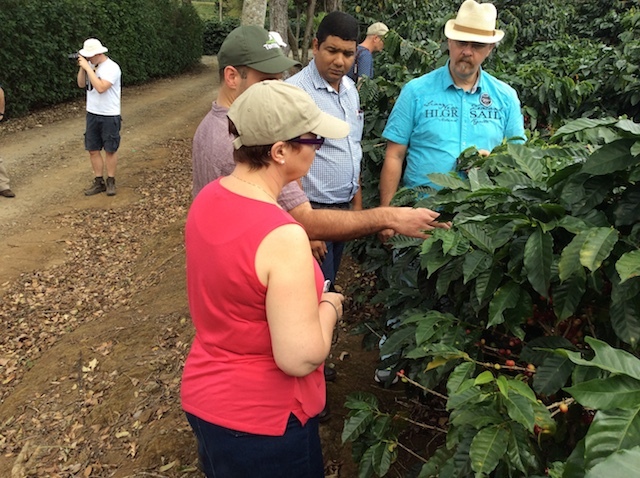 At the end of our visit we enjoyed a cupping (professional coffee tasting) coffees from Coricafe, as well as some samples from Costa Rican coffees you can find in the supermarket. As you can imagine (i hope so at least), there was a huge difference in taste between the speciality coffee from Coricafe and the supermarket coffees. 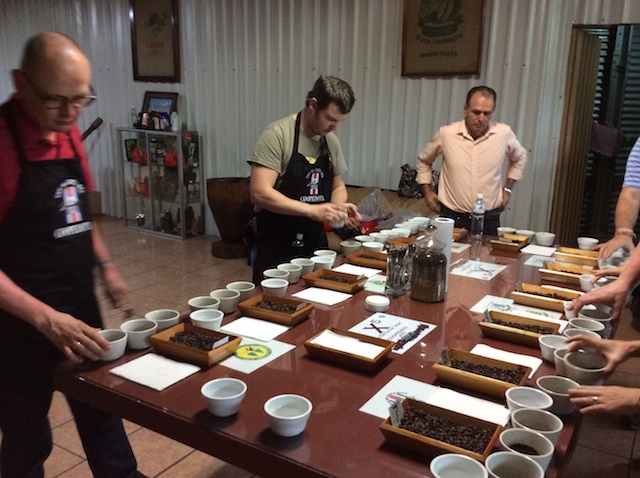 We liked the Coricafe samples by far more, nevertheless it was the first and only time to taste both in one cupping session and overall a very valuable learning experience! 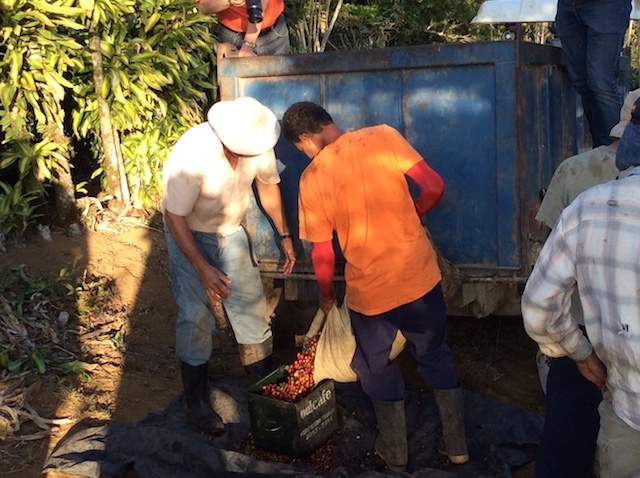 One of the highlights of that day was the visit of pickers at the coffee farm of Luis. Visiting pickers during the peak of the season is a sensitive issue. They are working hard and visitors rather disturb than are seen as helpful. 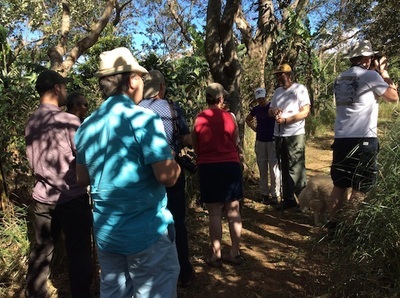 We went through the coffee field (exciting trail!) and fall in love with the ripe red cherries (see pic). Exporting season just started, so the warehouse is full, but i believe it will get even more full when the harvest that is now picked will be in available for shipping. 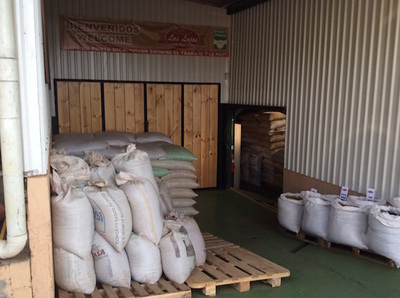 Once again i am impressed about the organization of the different coffee lots and bags. 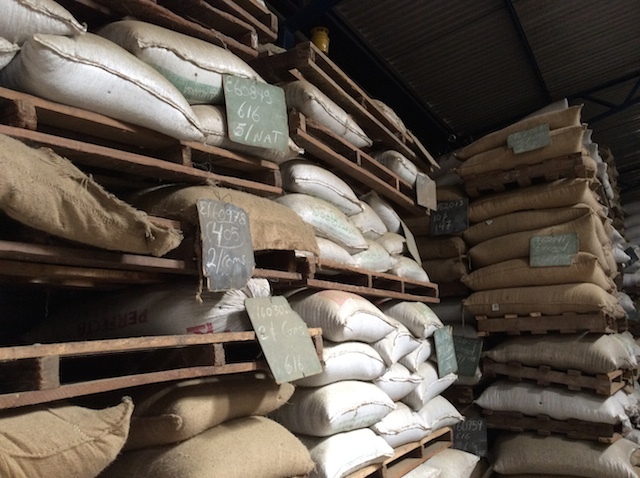 Though coffee is one of the most traded goods globally, it is possible to know where every bag goes to and where it comes from. Of course, that is only the case with speciality coffee. During our visit a container to Antwerp was prepared for shipping. A mobile band-conveyer helps to get those heavy bags into it. 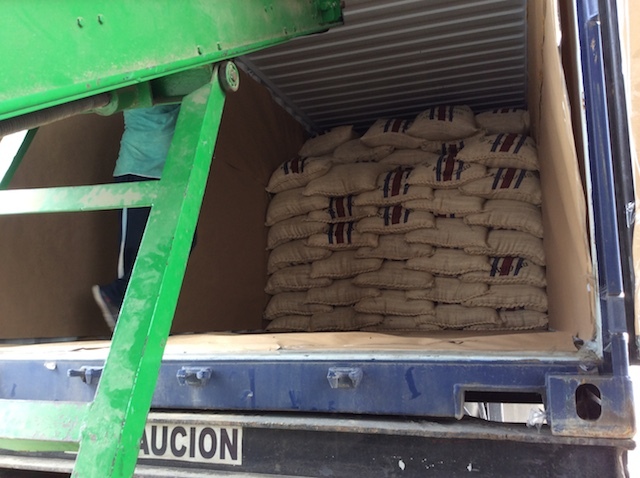 On the bottom stays the pallet with the coffee bags piled up, on the container a worker takes up each bag coming via the band-conveyer, piling it up neatly. This container was prepared on tuesday, brought to the harbor on time to catch the ship that departed the same week thursday or friday. The journey of the coffee to Antwerp will take approximately 15 days. 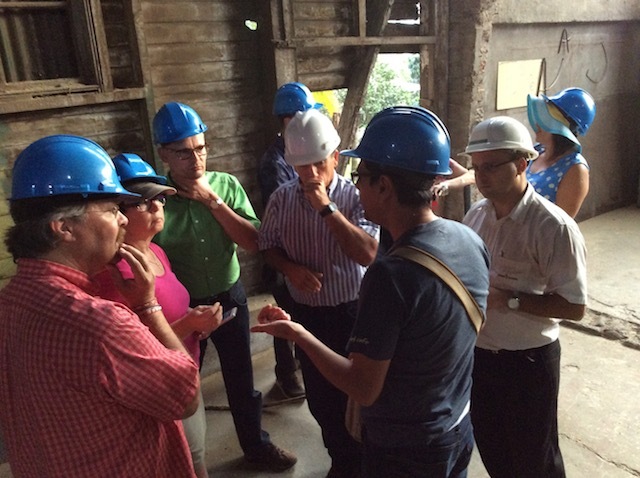 In the afternoon of the same day we visited another wet and dry mill, the one of Café de Altura de San Ramon run by Luis Varela. It is a huge and impressive mill, also working with micro lots and a new idea of approaching the honey process: anaerobic fermentation. Meaning fermentation without air. It is called diamond honey and need to be carefully executed, as it is very much about the right moment to stop fermentation. We were allowed to join the procedure of collecting and measuring the picked cherries from the pickers of the day. Luis' son came with a truck to pick up the cherries. Bag by bag is measured through the green metal basket. It has the size of one basket the pickers use to collect their cherries and is called "cajuela". 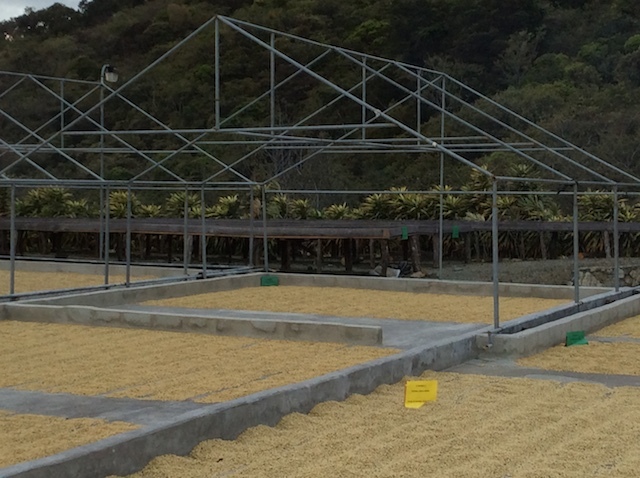 The green metal basket/box is calibrated through ICafe and a standard measurement in Costa Rica. It was an incredible impressive day that ended with a delicious dinner at Luis house where his daughter prepared a 3-course menu for us. Thanks once more! 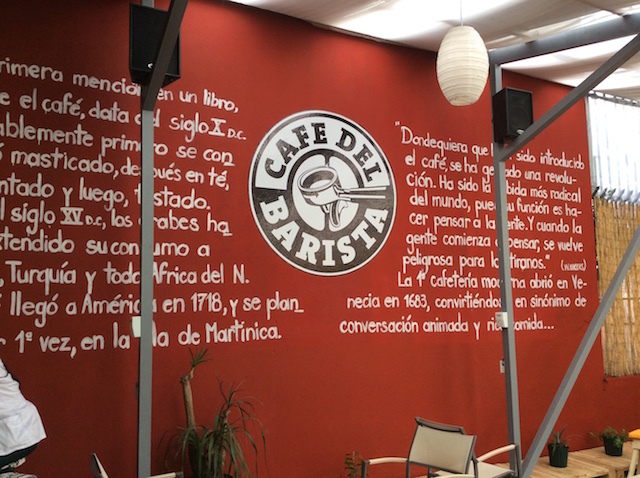 Monday after visiting la Finca Rosa Blanca, we took off to ICafe. 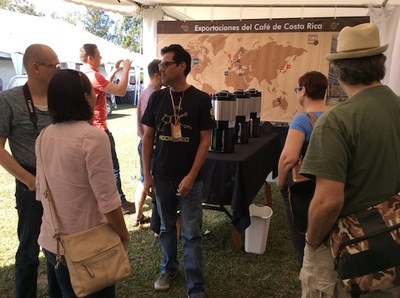 The coffee institute of Costa Rica was established 1933 and is an organization financed through a share of 1,5% from all coffee purchases. 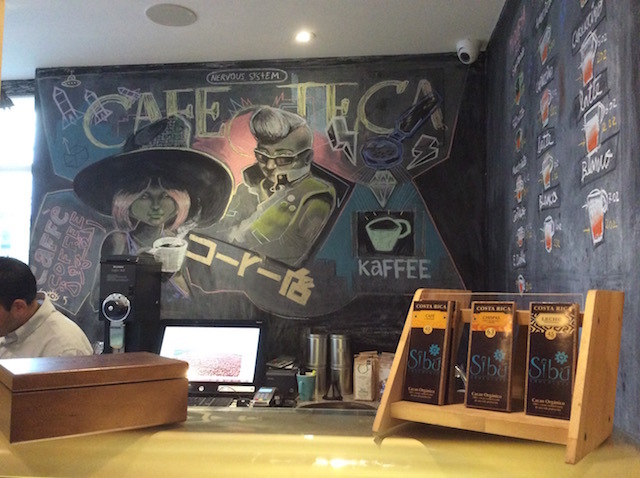 ICafe's tasks are two-folded: research and promotion of Costa Rican coffee. After our arrival, we firstly enjoyed a good coffee - so much appreciated directly after lunch! We decided to walk through the research plants first, and having a presentation about Costa Rican coffee and ICafe afterwards. Together with the engineer and the communication officer went with us through the research farm. 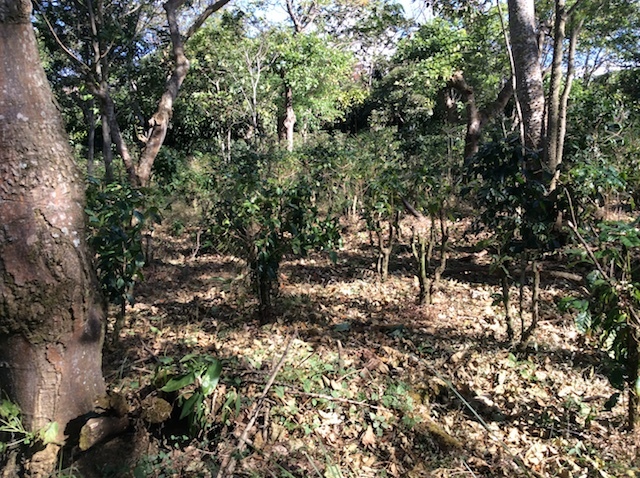 ICafe experiments on a huge area of coffee plantation. 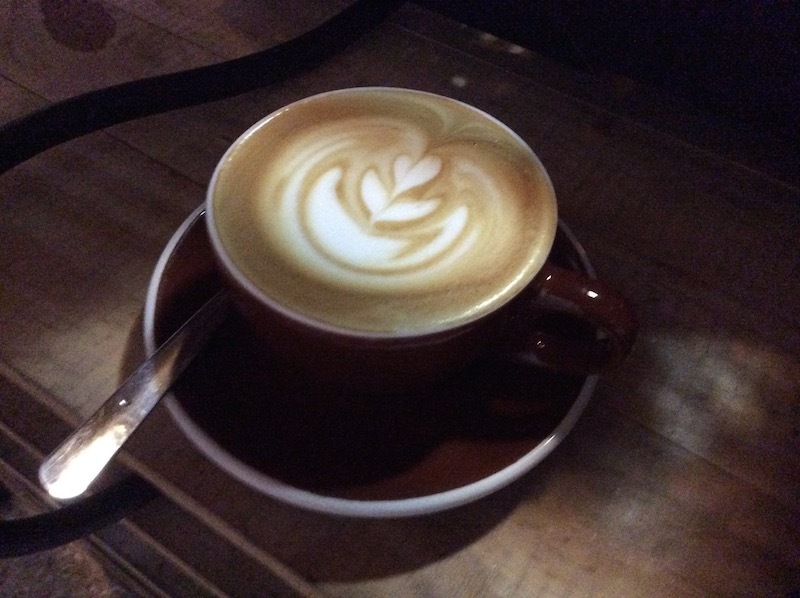 Those are decided into several sections hosting different varieties of coffee (e.g. caturra, venecia, as well as a hybrid from caturra and fumes sudan). 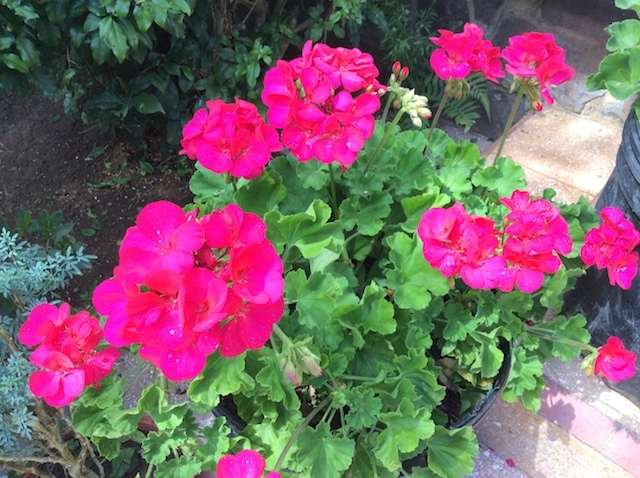 Of interest are combinations of varieties that deliver more harvest or that are more resistant to pest/vermin. 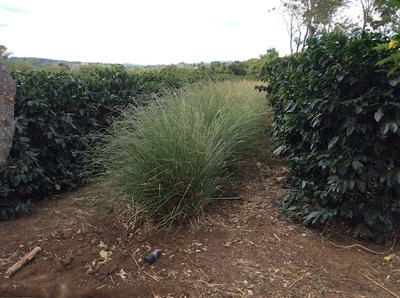 Also on this research farm we can see smaller plants (similar to fern) that are planted in rows betweens the coffee plants. Their function is to avoid erosion during rain season. Very smart, i think. 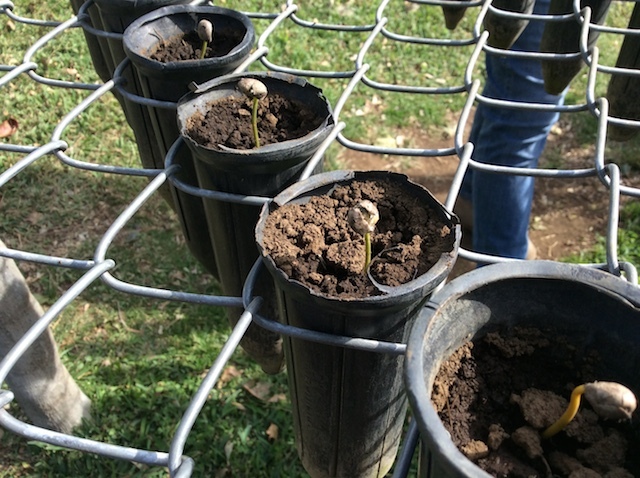 Though it is forbidden by law in Costa Rica to grow Robusta coffee, ICafe is allowed to plant few Robusta coffee plants for research purposes. 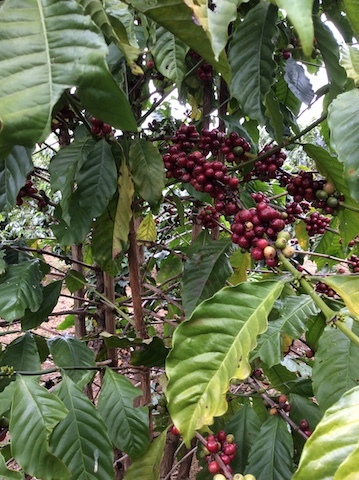 Compared with Arabica, the cherries of a Robusta grow in bunches on the branch, whereas Arabica grows more widespread along the branch. Beautiful to see were some coffee plants who already carry few blossoms for the new season (see pic below). 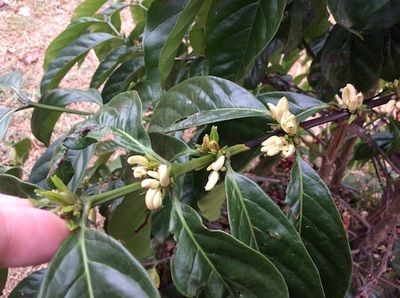 During blossoming time, starting from march and lasting till june, coffee farms are full of blossoming coffee plants that smell like jasmine! I am curious to experience that time as well, let's see when that will be. 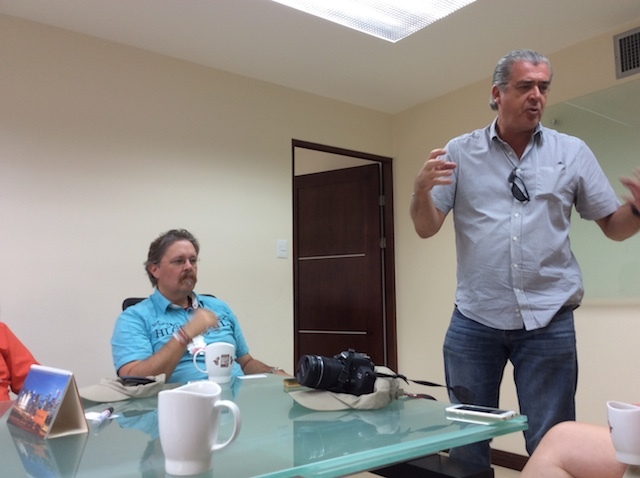 After returning from the walk through the farm, Mario (Director or Marketing from ICafe) introduced us to the tasks of ICafe and showed some figures and facts about Costa Rican coffee production. 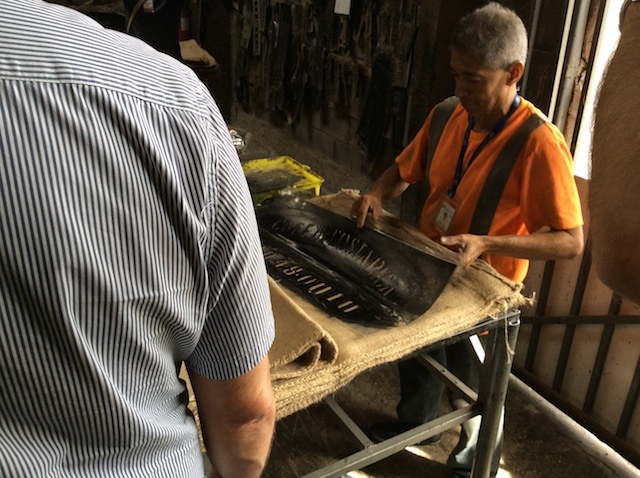 There were a lot of interesting figures, for example the minimum wage that is guaranteed by law and that is currently 2$ per Cajuela (that is the basket pickers use for collecting cherries). That minimum wage is not paid according to picking time but according to volume of picked cherries. In a separate posting i will come to more figures about this. 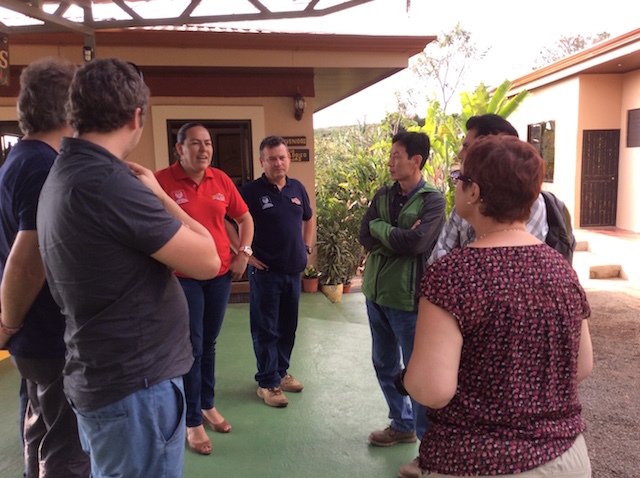 During the tour we meet the owner Max and his wife. Max could tell hours about the farm, but that is Manolos job, our guide. 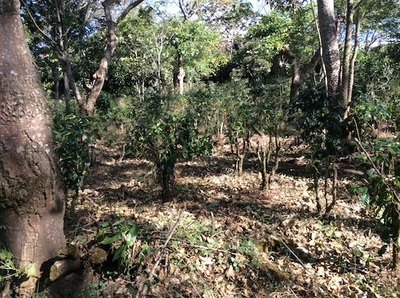 Finca Rosa Blanca is an ecological coffee farm. It looks like one big beautiful garden. 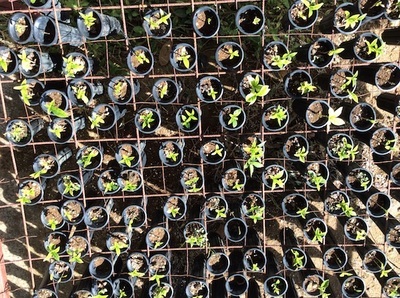 Finca Rosa Blanca maintains an own nursery meaning baby coffee trees. Until they are one year old they stay in these special trays. On the farm also other plants are growing, for example pineapples or banana trees. 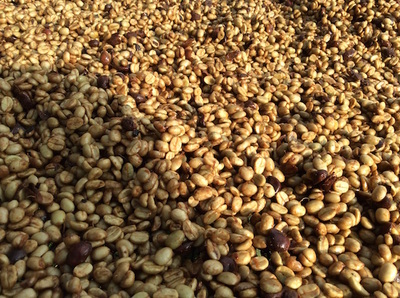 The fully washed beans dry on african beds. In case of rain the plastic blanket can be easily put over them. Today i share a video with you i made directly after arriving in Costa Rica San José airport. I had the service to be picked up and brought to the hotel. This video thus is somewhere between the airport and the city of San José. Enjoy this little minute to get an impression or recall some memories, depending on your background in travelling to Costa Rica. Wir sind zu Gast bei Juan, der eine Micro-Mill betreibt und 12 Plantagen besitzt. Der Großteil seiner Ernte geht über einen Großhändler nach Japan. 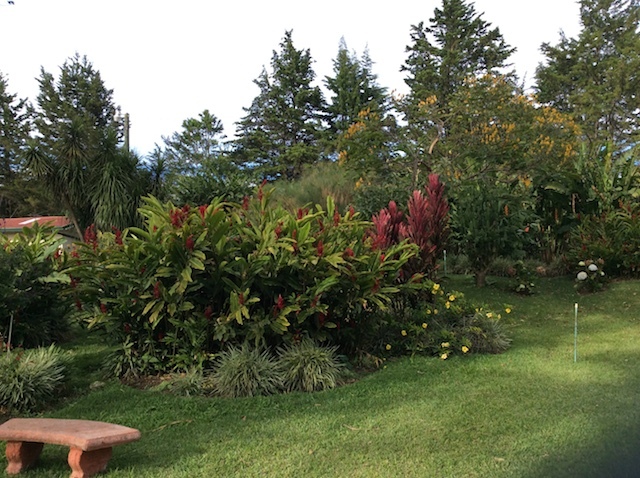 Nature is just impressive at Doka coffee farm. It is really difficult to capture the beautiful colours in a picture. Juan trocknet die Kaffeekirschen auf Patios und auf African beds, wie hier zu sehen. Zwei Erntehelfer aus Nicaragua haken durch die Pergaminos, von oben nach unten. Nicht so einfach, ich durfte auch eine Seite haken; es muss gleichmäßig verteilt sein und geht in die Arme! 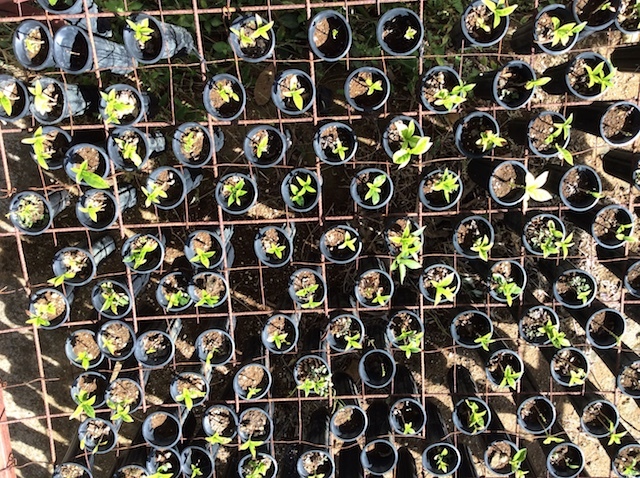 These are baby coffee plants: Because their shape reminds of a soldier they receive the spanish name for "little soldier". Also it reminds of the day when Costa Rica decided to give up their military. Today the coffee are the countries' soldiers, goes the saying. Auf der Finca und Micro-Mill verarbeitet Juan die Arabica-Sorten Catuai, Caturra und Geisha. Alle Kirschen werden entweder im Honey-Prozess oder Natural Kaffeekirschen aufbereitet. 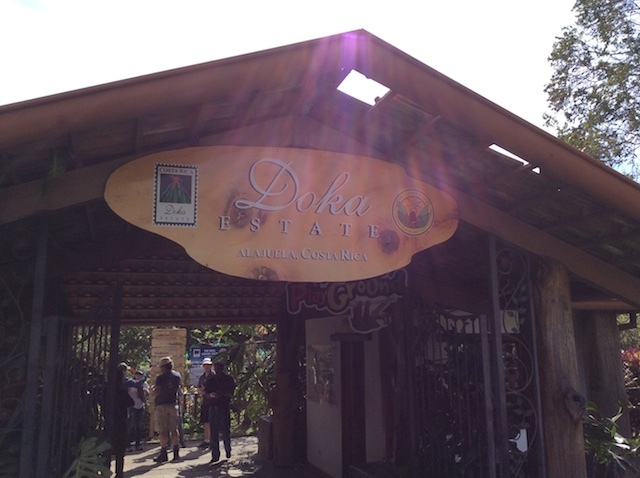 At Doka coffee farm in Alajuela we have a snack, some coffee from the local roastery ( peaberry beans) before we join a touristic coffee tour. Day II (or today as we call it) starts with a visit at Coopedota R.L. 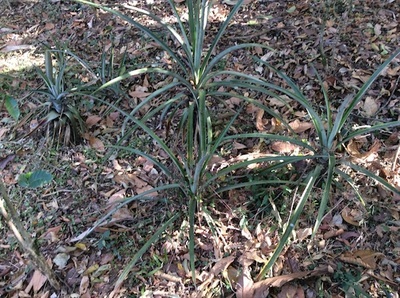 in Santa Maria de Dota. 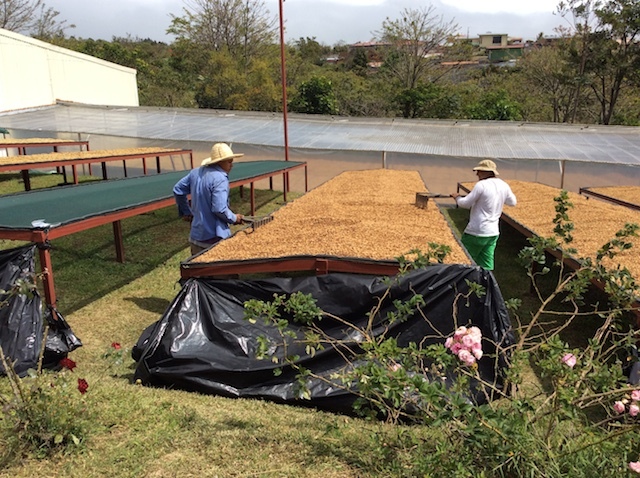 It is owned by a cooperative of coffee farmers in total consisting of a washing station, drying mill, roastery, café and some more coffee-related business branches. Coopedota R.L. i recall very well because Elbgold Roastery in Hamburg offers direct traded coffee from this cooperative. 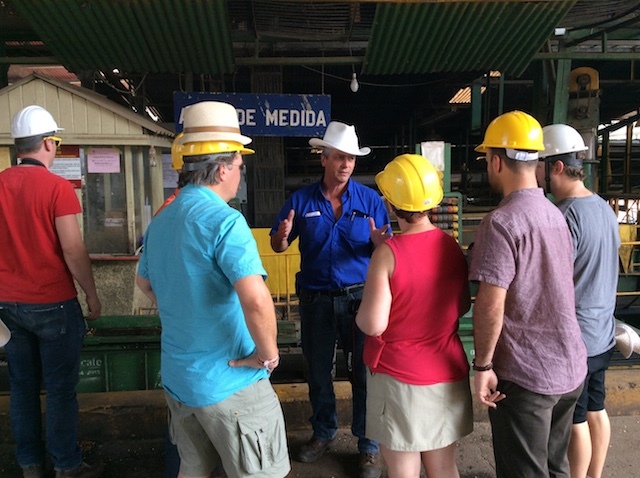 The manager Senor Naranjo took the time to explain us about Coopedota, showed us around, answering all our questions. 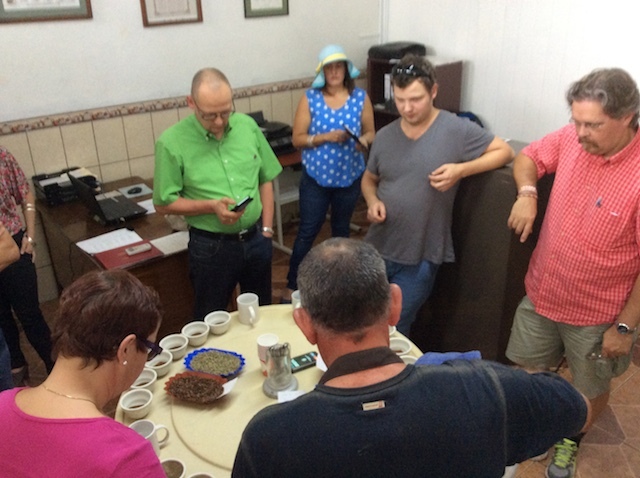 Also a cupping was part of this visit. General favourite among the samples was an experiment based on Arabica type Typica, honey processed. The special taste (balanced acidity and sweetness, combined with an exciting complexity) went directly from the tongue to the heart. 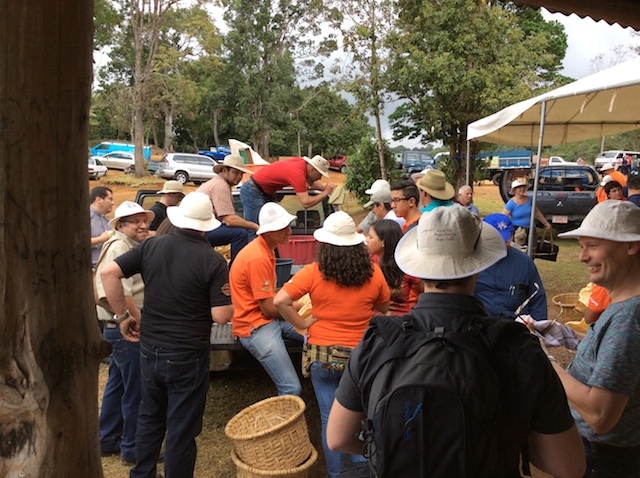 After lunch we departed to another cooperative based in the region of Tarrazú, Coopetarrazú, 20 minutes away from Coopedota. 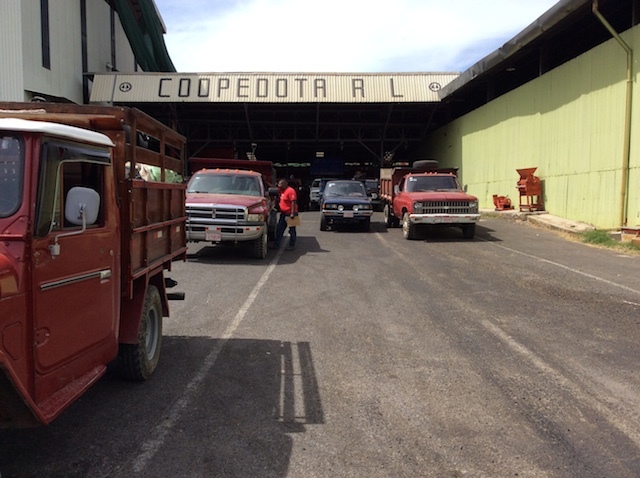 Here we had the same elements as in Coopedota just in reverse order: First cupping, then a tour through the mill. The mill is really big, and the lorries bringing the coffee to the mill have three till four times the size as the trucks approaching the competitor Coopedota. 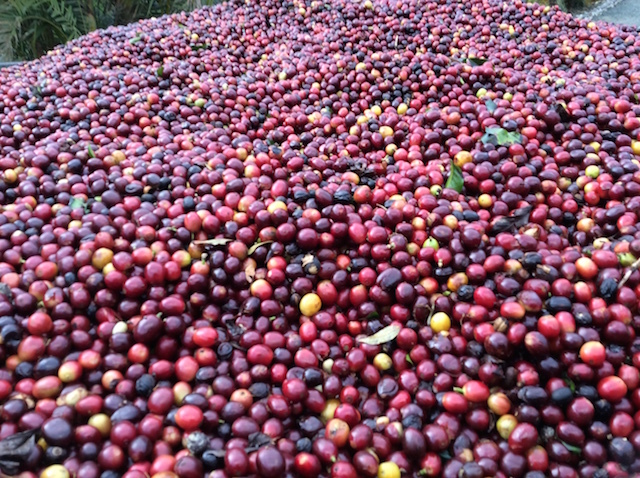 It is peak of the season, so there is coming in a substensive amount of coffee cherries. Overall a beautiful day, no sunburn from my side, no mosquito bites so far, finally purchased a local simcard and thus a cheap and stable wifi connection. Tag I unseres Coffee Field Trips in Costa Rica. Los geht's auf eine Kaffeemesse. 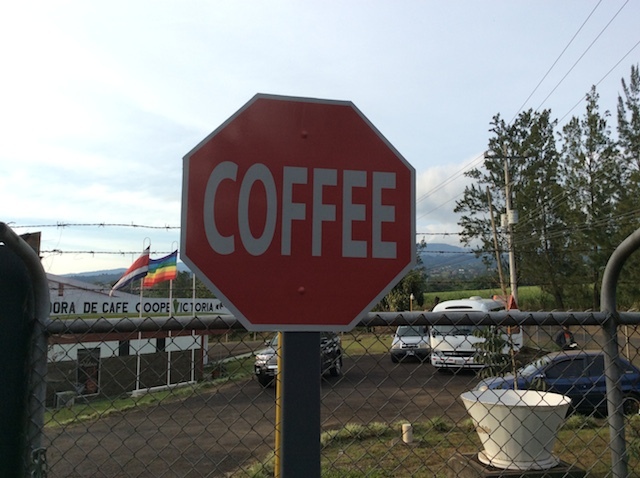 Hier präsentieren Händler costaricanischen Kaffee und andere Spezialitäten. Unseren ersten Kaffee nehmen wir am Stand von Boleto ein. Im Becher: Der Gewinner Costa Ricas vom Cup of Excellence 2014 aus einem Hario V60. Lecker! Highlight wird auf dieser Messe der Wettbewerb im Kaffeekirschen pflücken sein. Dazu tritt unsere Gruppe gegen zwei ander Gruppen an, die aus costarikanischen Vertretern von Ministerien, Kirchen, und Popstars bestehen. Um es kurz zu machen: Insgesamt führten wir das Feld von hinten an, aber es hat viel Sapss gemacht Kaffee zu pflücken! Echt anstrengend! Weiter geht's zur Micromill Río Jorco. Dort nimmt sich der Manager ausführlich Zeit für uns. Wir sehen die Entpulpungsanlage, das erste Trocknen über Feuerholz sowie die Aufbereitung auf Patios und African beds. Neben den gewaschenen Qualitäten befinden sich auch einige Kirschen im Red und yellow honey process sowie die natural Aufbereitung auf African beds. Als eine Fuhre roter, reifer Kirschen ankommt, dürfen wir auch helfen diese vom Laster durch eine Luke in die Anlage zu befördern. Dazu bedarf es einiges an Kraft, denn die Hebel sind schwergängig und das Material der Luke schwer. Wir beenden den fantastischen ersten Tag mit einem wunderbaren Essen im Baumhaus des amerikanischen Besitzers dieser Micromill. Ein unfassbar schöner Ausblick zum Abschluss eines sehr gelungenen Tages! Zuerst ging ich ins Café Toma ( Calle de Palma 49). Online fand ich schon einige vielversprechende Hinweise auf die Brühkunst des schwarzen Getränks namens Kaffee. Der Espresso Blend Santos, den es in die Tasse gab, besteht zu 60% aus äthiopischen Bohnen und je zu 20% aus brasilianischen und guatemaltekischen Bohnen. Und zum Americano konnte ich einem Stück Birnen-Schokoladen-Kuchen nicht widerstehen. Wifi gabs gratis dazu, praktisch dazu gleich den passenden Kaffeeherz-Tweet abzusetzen (@toma_cafe). Der Kaffee war sehr lecker, süffig, schöne Säure und Süße und konnte seine äthiopischen Wurzeln schön ausspielen. Das Toma zieht gemischtes Publikum an: Studenten, Mutter und Kind zum Kakao, Pärchen, Einzelpersonen. Die Holzstühle, die aus einem Klassenzimmer stammen könnten, und die Rennräder im Raum und an der Decke verleihen diesem Café seinen einzigartigen Charme. Warum Americano und nicht Cappuccino? Im Ausland laktosefreie Milch zu finden ist schwer. Und Soyamilch und ich werden keine Feunde. Daher ist meine naheliegende Wahl der Americano. Doch sowohl das Toma als auch das Federal bieten Soyamilch an, falls das für jemanden von Interesse ist. 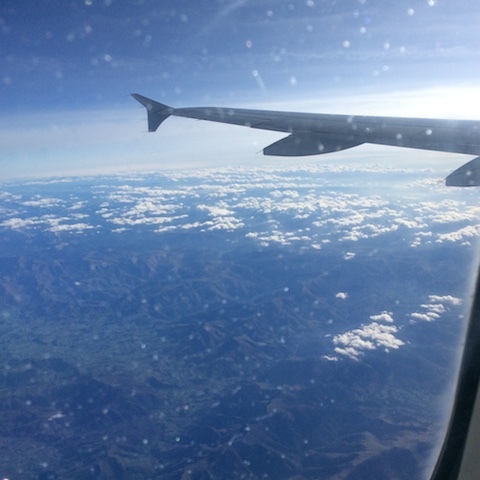 Der erste Teil der Reise führt mich nach Madrid. Dort war ich in den vergangenen Jahren aus beruflichen Gründen mehrfach. Sehr praktisch, befinde ich, denn die Stadt ist mir in Grundzügen vertraut und die Orientierung gelingt schneller. Ich habe etwas Zeit hier bevor es weiter über den Atlantik geht: Diese Chance nutze ich, um mir zwei Cafés anzusehen, die ich mir vorher rausgesucht habe.